1-2 Tbl. coconut oil or ghee enough to cover bottom of skillet. Heat skillet on medium high heat. Next spread either fresh minced garlic or sprinkle garlic powder and dill. Last add fresh ground pepper to taste. If using sesame seeds sprinkle them on at this time too. Once pan is hot, add coconut oil or ghee (we prefer coconut oil). Then place fish skin side down in heated pan. Pan should sizzle when fish hits the pan. Cover fish and cook for 5 minutes. Sides of fish will begin to turn opaque or light pink as it cooks. Using a long “fish turner” spatula, carefully flip the salmon, and cook another 5 minutes, uncovered. 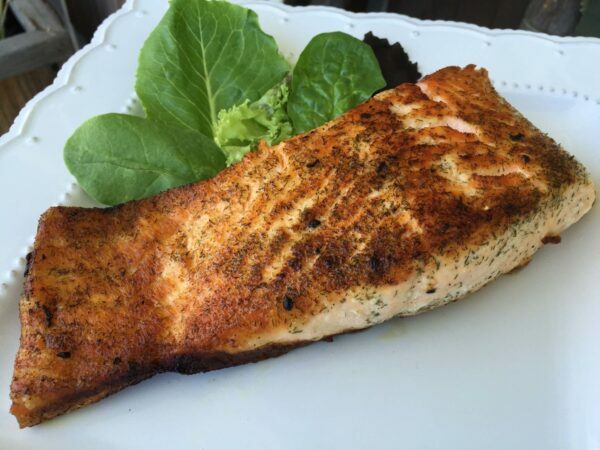 The amount of time you continue to cook your fish will greatly depend on how well done or rare you like to eat your salmon. Each variety, thickness, and preference will vary to the amount of time you cook your fish. After you’ve flipped your fish and cooked it the 5 additional minutes, turn it back over one last time. It should have a nice browned seared top and is ready to check to see if it’s done. Fish should feel firm to the touch. Check your fish AFTER ITS had time to REST for about 3-5 additional minutes while covered in the pan. It will continue to cook while its rests. IF you like it undercooked, omit this part.